David earned a Masters of Arts Degree from Central Michigan University. 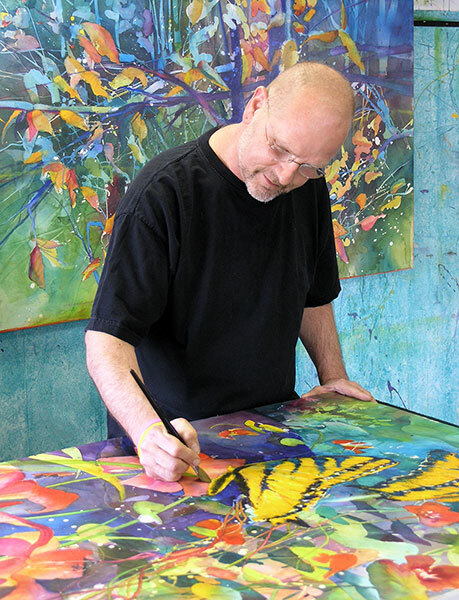 After 15 years of teaching in the Michigan public school system he moved to Washington, DC to pursue an art career. In the past several years, David’s talent has earned him the distinction of Best of Show in such prestigious organizations as the Capitol Hill Art League of Washington, DC, the Cultural Society of Coral Springs, Florida and the Washington Watercolor Association of Washington, DC. In addition to being a working artist, David is a dynamic and engaging watercolor instructor. He is the watercolor instructor for the Smithsonian Institution of Washington, DC, is a former instructor at Montgomery College in Maryland, and he teaches workshops throughout the world. David is on the faculty of the Amalfi Coast Music & Arts Festival in Italy. He has been involved with such art-related activities as the Boat House Art School of Washington, DC, where he was the director for two years; the Hirshhorn Museum and Sculpture Garden Docent Program; and he has affiliations with numerous art organizations and associations. Recently David was featured in American Artist Magazine, and his works can be found in two new publications by Rockport Publishers: The Best of Watercolor Composition and Floral Inspirations. David is included in Who’s Who in American Art. His work can be found in corporate collections of such organizations as the Quadrangle Corporation, Michigan Education Association, Home National Bank of Arkansas City Kansas, and the private collection of the National Institutes of Health.